Carpool to DCHS on Saturday? I drive a Dodge Grand Caravan and have lots of room. I live in Orange County, but can meet anywhere along the 55, 91, 57, 10 or 15 Freeways. It's all about spending as much time as possible at Southern California's most beautiful water attraction so I leave early and can meet you around 7:00 AM. 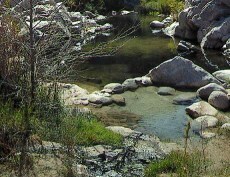 I usually stop in Hesperia or Apple Valley for coffee and munchies and hope to be in the healing water of the springs by 10:00 AM. I like to leave after the heat of the day, but before dark.